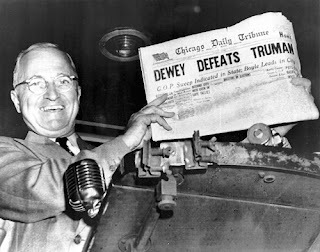 In the fall of 1948, Harry Truman barnstormed the country by train, repeatedly bashing  a “do-nothing Congress,” and so snatched victory from the jaws of defeat  in that year’s presidential campaign. This year, neither presidential candidate focused on blasting a do-nothing Congress or, in Obama’s case, “Republican obstructionism,” demanding that the voters give them a legislative body that would mean an actual mandate for change. We now know the results of such a campaign and, after all the tumult and the nation’s first $6 billion election , they couldn’t be more familiar. Only days later, you can watch a remarkably recognizable cast of characters from the reelected president and Speaker of the House John Boehner to the massed pundits of the mainstream media picking up the pages of a well-thumbed script. Will it be bipartisanship or the fiscal cliff? Are we going to raise new revenues via tax reform or raise tax rates  for the wealthiest Americans? Will the president make up with Israeli Prime Minister Benjamin Netanyahu or not? Will it be war or something less with Iran? And so on and so forth. It’s the moment the phrase déjà vu all over again was made for. When a new Chinese dynasty came to power, it was said that it had received “the mandate of heaven.” We’ve just passed through an election campaign that, while the noisiest in memory, was enveloped in the deepest of silences  on issues that truly matter for the American future. Out of it, a “mandate” has indeed been bestowed not just on Barack Obama, but on Washington, where a Republican House of Representatives, far less triumphant  but no less fully in the saddle than the president, faces media reports that its moment is past, that its members are part of  “the biggest loser demographic of the election,” and that its party–lacking the support of young people , single women , those with no religious affiliation , Hispanics , African Americans , and Asian Americans –is heading for the trash barrel of history. If true, that does sound like a mandate for something, sooner or later–assuming you happen to have years of demographic patience. In the meantime, there will be a lot more talk about how the Republicans need to reorient their party and about a possible “civil war ” over its future. And while we’re at it, bet on one thing: we’re also going to hear a ton more talk about how much deeply unhappy Americans–the very ones who just reinstalled a government that’s a senatorial  blink away  from the previous version of the same–really, really want everyone to make nice and work together. That, in turn, ensures two different but related outcomes, both little discussed during the campaign: continuing gridlock on almost any issue that truly matters at home and a continuing damn-the-Hellfire-missiles, full-speed-ahead permanent state of war abroad (along with yet more militarization  of the “homeland”). The only winners–and don’t believe  the outcries you’re hearing about sequestration “doom” for the military–are likely to be the national security complex, the Pentagon, and in a country where income inequality has long been on the rise, the wealthy. Yes, in the particular circle of hell to which we’re consigned, it’s likely to remain springtime for billionaires and giant weapons manufacturers from 2012 to 2016. How do we know that gridlock and a permanent state of war are the only two paths open to the people’s representatives, that Washington is quite so constrained? Because we’ve just voted in a near-rerun of the years 2009-2012, which means that the power to make domestic policy (except at the edges) will continue to slowly seep out of the White House, while the power of the president and the national security state to further abridge  evaporating liberties at home andmake war abroad  will only be enhanced. The result is likely to be stasis for the globe’s last superpower at a moment when much of the world–and the planet itself–is in the process of tumultuous transformation. Here are things not to expect: a major move to rebuild the country’s tattered infrastructure ; the genuine downsizing of the American global military mission; any significant attempt to come to grips with a changing planet and global warming; and the mobilization of a younger generation that, as Hurricane Sandy showed , is ready to give much and do much to help others in need, but in the next four years will never be called to the colors. The United States remains a big, powerful, wealthy country that is slowly hollowing out, breaking down. Meanwhile, on planet Earth, the global economy is up for grabs. Another meltdown is possible , as the European, Chinese, Japanese, and Indian economies all continue to take hits. Power relations have been changing rapidly, from the rise of Brazil in what was once Washington’s “backyard” to the Chinese miracle (and the military muscle that goes with it). A largely American system that long helped keep the Greater Middle East, the energy heartlands of the globe, under grim, autocratic control is unraveling with unknown consequences. Above all, from increasingly iceless Arctic waters to ever more extreme weather, rising sea levels, and the acidification of the oceans, this planet is undergoing a remarkably rapid transformation based largely on the release into the atmosphere of carbon dioxide from the burning of fossil fuels. Other than a few curious Republican comparisons of an American economy under the Democrats to “Greece ,” a near obsessive focus  on the death of Ambassador J. Christopher Stephens and three other Americans in Libya, and various denunciations of China as a currency manipulator , not a single one of these matters came up in any meaningful way in the election campaign. In other words, election 2012 boiled down to little more than a massive case of Washington-style denial. And don’t for a second think that that’s just an artifact of election year artifice. Take climate change, which like the Arab Spring blasted its way into our unprepared midst in 2011-2012. There was the wildfire season  of all seasons in a parching Southwest and West, a devastating drought  that still hasn’t fully lifted  in the Midwestern breadbasket (or corncob) of the country, and a seeminglyendless summer  that may make this the hottest year on record  for the continental United States. It was staggering and, if opinion polls  are to be believed, noted by increasing numbers of concerned Americans who could literally feel the world changing around them. And yet none of this made global warming an election issue. Month after month, it was The Great Unmentionable. The silence of emboldened Republicans plugging their drill-baby-drill and lay-those-pipelines policies and of cowed Democrats who convinced themselves  that the issue was a no-win zone for the president proved deafening–until the campaign’s last days. It was then, of course, that Hurricane Sandy, the “Frankenstorm ,” swept through my town and devastated New Jersey. It provided the extreme weather coup de grâce of 2012. (And yes, there’s little doubt that climate-change-induced rising sea levels contributed  to its fury.) Superstorm Sandy also revealed just how unprepared the U.S. infrastructure is for predicted  climate-change events. Still, in just about  every sense that matters in Washington, real planning for climate change is likely to remain off that table on which all “options” always sit. Expect the president to offer Shell further support  for drilling in Arctic waters, expect a new push for the Keystone XL pipeline  which will transport some of the “dirtiest” energy from Canada to the Gulf of Mexico, and so on. Don’t count on anyone doing the obvious: launching the sort of Apollo-style R&D program that once got us to the moon and might speed the U.S. and the planet toward an alternative energy economy, or investing real money in the sort of mitigation projects  for the new weather paradigm that might prevent a coastal city like New York–or even Washington –from turning into an uninhabitable disaster zone in some not so distant future. Climate science is certainly complex and filled with unknowns. As it happens, many of those unknowns increasingly seem focused on two questions: How extreme and how quickly? It’s suggested that sea levels are already rising faster than predicted  and some recent scientific studies  indicate that, by century’s end, the planet’s average temperature could rise by up to eight degrees  Fahrenheit, an almost unimaginable disaster for humanity. Whatever the unknowns, certain things are obvious enough. Here, for instance, is a simple reality: any set of attempts, already ongoing , to make North America the “Saudi Arabia” of the twenty-first century in energy production are guaranteed to be a climate-change disaster. Unfortunately, this election ensures once again that, no matter what the planetary realities or the actual needs of this country, no significant money will flow into alteration or mitigation projects. Among the truly bizarre aspects of this situation, one stands out: thanks in part to a long-term climate-change-denial campaign , well-funded  by the giant energy companies, the subject has become “political.” The idea that it is a liberal or left-wing “issue,” rather than a global reality that must be dealt with, is now deeply embedded. And yet there may never have been a more basic conservative issue (at least in the older sense of the term): the preserving, above all else, of what is already most valuable in our lives. And what qualifies more for that than the health of the planet on which humanity “grew up”? The phrase “fiddling while Rome burns” seems to catch something of the essence of this post-election moment–and it has special meaning when the fiddlers turn out to be slipping matches to the arsonists. Just a week after the election, the Republican Party is already gearing up  to produce a new, better-looking, more “diverse,” better-marketed version of itself for the 2014 and 2016 Hispanic and Asian American “markets.” The Democratic Party is no doubt following suit. In American politics these days, presidential elections last at least four years. The first poll for Iowa 2016 is already out . (Hillary’s way ahead). Elections are the big business, sometimes just about the only significant political business Washington focuses on with any success, aided and abetted by the media. So look forward to the $7 billion or $8 billion or $9 billion elections to come and the ever-greater hoopla surrounding them. But stop waiting for change, “big ” or otherwise , to come from Washington. It won’t. Don’t misunderstand me: as the residents of the Midwestern drought zone and the Jersey shore now know all too well, change is coming, like it or not. If, however, you want this country to be something other than its instigator and its victim, if you want the U.S. to engage a world of danger (and also of opportunity), you’d better call yourself and your friends and neighbors to the colors. Don’t wait for a Washington focused on its own well-being in 2014 or 2016. Mobilize yourself. It’s time to occupy this country before it’s blown away in a storm. Tom Engelhardt runs the Nation Institute’s TomDispatch.com . His latest book, co-authored with Nick Turse, is Terminator Planet: The First History of Drone Warfare, 2001-2050 . Follow TomDispatch on Twitter . Copyright 2012 Tom Engelhardt. 3 Comments To "How Not to Change the World"
Amen! The time is now to start builidng new nuclear power plants. How we can be so far behind France (FRANCE!) on this is beyond comprehension. Will Obama cut the size of the bloated, fantastically expensive US military machine? Will Aipac prevent any effort to get Israel out of the West Bank? The two party system undermines democracy, since in a country as huge and diverse as this, the meaning of a vote becomes vague. This election clearly shows that. By choosing Paul Ryan, Romney seemed to make the election a referendum on social security and Medicare (Ryan is known only for advocating touching this third rail). But the elites interpreted the election as a referendum on immigration. Of course, if Romney had won you can bet it would have been seen as a mandate for touching the third rail (that’s probably the reason Ryan was chosen). The elites both on the left and the right (as you know if you read the WSJ) have long favored liberal immigration policies. And the elites (even, or maybe especially, the “liberal” media) have long insisted on the need to cut “entitlements” That’s because the liberal media has been hardly less supportive of our hyperexpensive foreign policy than the right. So elections are interpreted as the elites want. To be meaningful we need more parties or a less powerful mass media.